Thanks to our wonderful readers, Elaine is now getting not one, but two of these cute little bunnies! I’m looking for this small DanDee multi-colored chenille bunny rabbit. It is approximately 5 inches tall, with a pink body and yellow and blue arms. 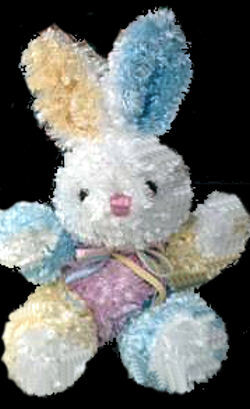 If you can help Elaine find this DanDee multi-colored bunny rabbit, THIS SITE IS NO LONGER ACTIVELY MANAGED. Please use Our FREE FACEBOOK GROUP, including #022408-1 in the subject, . Found a look-a-like with blue and pink ears and green body in a second-hand store near my home. If you like it, please contact me. I have emailed her with your email address. Hope it works out!